For breakfast this past Saturday, a group of fortunate bloggers and I had wines from Brazil. While it certainly doesn’t sound like an onerous task, at times it can be if you have to taste very heavy wines. Luckily, none of the wines we tasted were too heavy although all the wineries were proponents of oak aging except for one. A few of the wines I found to be surprisingly friendly for 930am. This was not the first time I had tasted wines from Brazil and what I found interesting is that my tastes had not changed. I still really enjoyed the wines from Casa Valduga and from Lidio Carraro that I had tasted two years earlier and written about here. Brazil has six major wine regions. There are over 1,100 wineries in the country, mostly small farms. 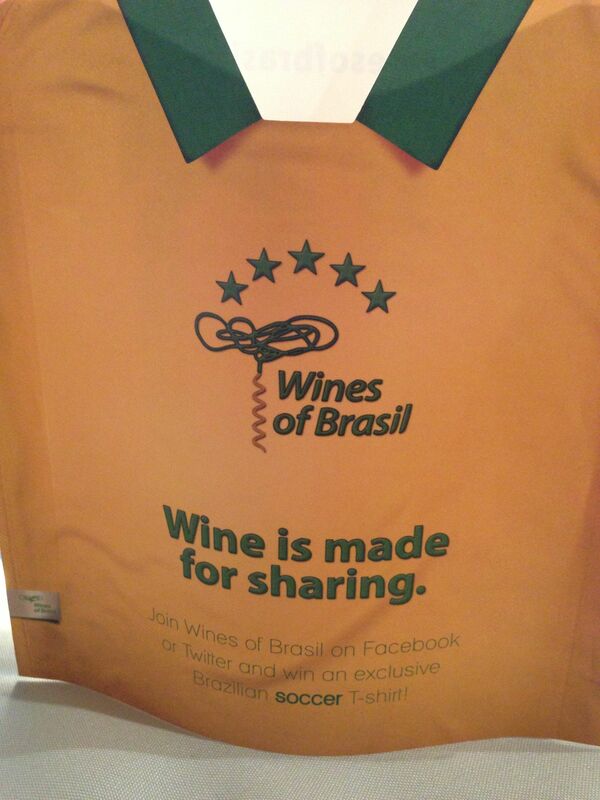 Despite growth in the industry, Brazilians still only drink two liters of wine. It is the fifth largest country in terms of wine growing in the Southern Hemisphere following Argentina, Australia, South Africa and Chile. 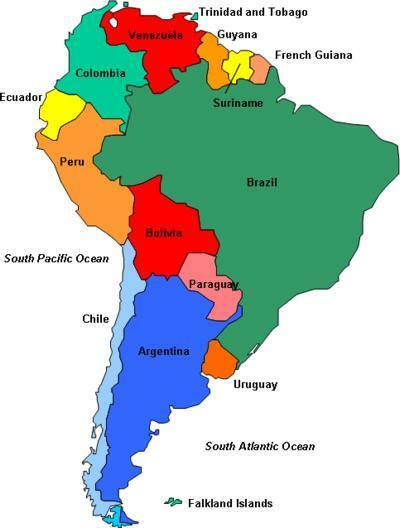 Brazil is also the world’s fifth largest economy with a population just shy of 200 million people. Mauricio Roloff from Ibravin who led the seminar with Gregory Del Piaz from Snooth told a joke that the way you know if someone is Brazilian in a restaurant is because they are drinking imported wine while the way to tell a tourist is that they instead, are drinking Brazilian wine. We tasted through fourteen wines from a couple of different vintages. Generally, I thought the wines were friendly and relatively easy to drink. Oddly enough, Brazil’s growing regions are colder and damper than one might think and some of the wines had a decidely “cool climate” vibe. A quick look through the names of the wineries clearly shows the strong connection to Italy, especially in the Serra Gaucha region. The grapes used in the wines we tasted were decidedly international varieties: Cabernet, Merlot, and Chardonnay dominated. The Valduga family came to Brazil from the town of Rovereto in Italy in 1875. They planted their first vineyards in the Vale dos Vinhedos region. 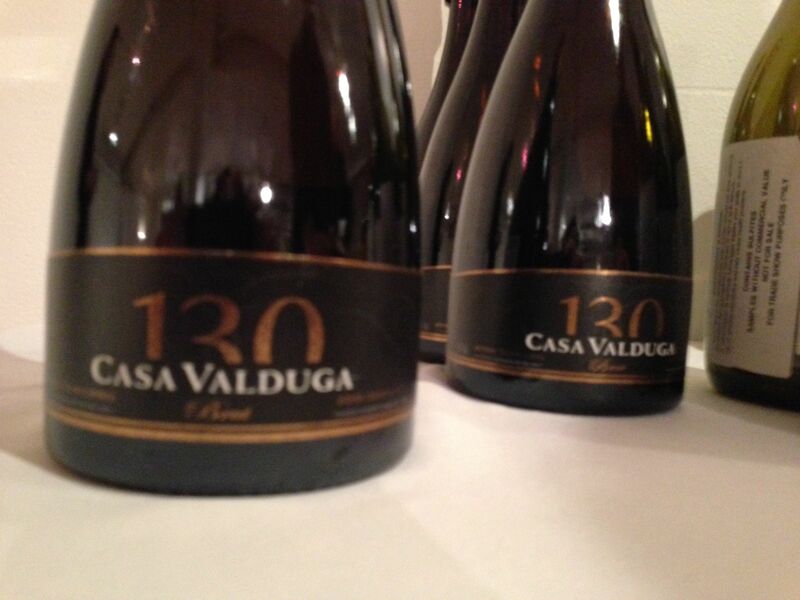 Today, three generations later, Erielso, Juarez and João Valduga still run this winery which has concentrated on making sparkling wines using the traditional method. I also liked the Lidio Carraro Dadivas Chardonnay 2012, SRP $19.99 which I found shocking as I am not partial to Chardonnay at all. Carraro uses no oak in his winery but the wine rests on its lees for a long period. The Chardonnay had aromas and flavors of white flowers, pears and apples and considerable minerality according to my notes. The winery was created in 1998 and the first harvest was 2002. The winery just announced this week that they have been awarded the contract to produce the official licensed wines of 2014 Fifa World Cup of Brazil with its FACES brand. That’s quite a coup in terms of his marketing and branding I would say. 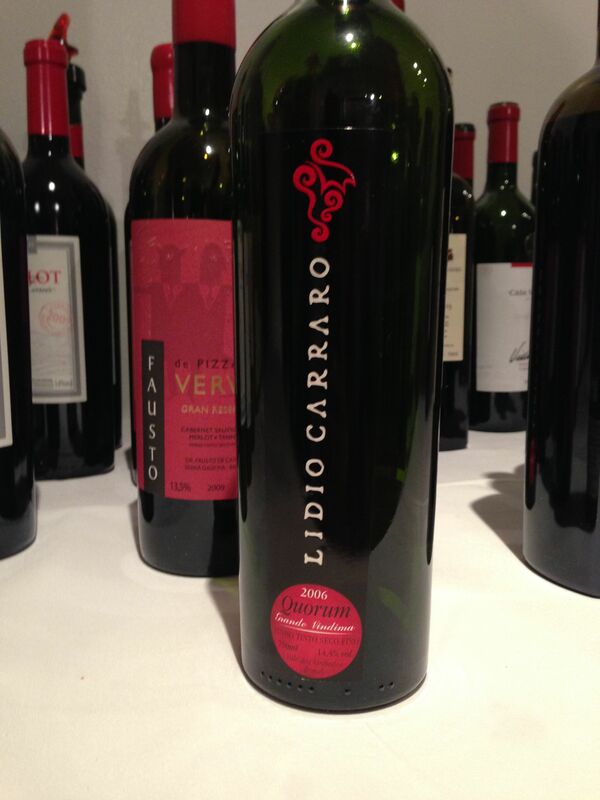 His Lidio Carraro Grande Vindima Quorum 2006 at $64.99 wasn’t an everyday wine but I thought this Merlot dominated blend was lovely with its blackberry flavors and ripe, juicy tannins. The blend was a combination of Merlot, Cabernet Sauvignon, Cabernet Franc, and Tannat. Merlot seems to do very well in Brazil and we discussed whether it could become the signature grape variety from Brazil, much as Tannat is in Uruguay, Malbec in Argentina and Carmenere in Chile. We tried two merlots from the 2009 vintage, a Pizzato Riserva Merlot SRP $19.99 and Miolo Merlot Terroir $23.99. I found the Pizzato to have some leather overtones while the Miolo was more fruit forward. Miolo is a very large player in the Brazilian market. The Salton Merlot, Desejo 2007 $21.99 was also of interest with its full bodied, spicy nose and pleasing, velvety mouthfeel. In general, it seemed that the wines were well-made with a little too much oak on many. The sparkling wines certainly have a place in the market although the wines are not inexpensive. While not an exhaustive tasting, it was certainly a further introduction to the wines of Brazil, a country I look forward to reading more about while drinking more of their wines and to visiting someday soon, as soon as I improve my Portuguese, my next linguistic challenge. I too have, been there and tasted the Brazil wines and feel the deep potential, but until they get rid of the consultant who helped set up the recent planning and get rid of Bordeaux varietals the drought will continue- No one in their right mind will select a Cab or Merlot from Brazil from a shelf full of Napa, France, South Africa, Australia, Argentina or Chile- It is not a Market potential. They have to go to their roots and use either Portuguese of Italian traditional and historic Varietals and use these to bring forward a market, and these would make stunning wines in the climate and terroir of their regions.